Fenland Rods fished North View Fishery at Gedney Hill on Sunday which saw Mac Campbell lead the way from peg two. He caught well all day close in on cat meat for 112lb 6oz. Runner-up was Les Bedford, who used similar tactics for 88lb 10oz. Third was Matt Lutkin on 73lb 8oz. 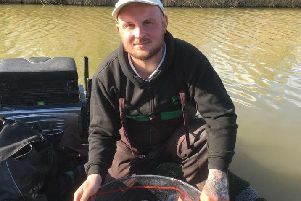 The Two Island Pool at Float Fish Farm Fishery continues to fish well and in the Conservative Club match on the venue it was John Newman once again taking the top spot in what is turning out to be a very good season for him. He caught on a short pole line fishing and feeding pellet for 72lb 2oz. Runner-up was John Hudson, who caught on a small Method feeder for 60lb 10oz, then came Tony Rudd with 60lb 2oz.